I have recently enjoyed documenting a couple of tea sets in the science collection and want to share their compact delights. 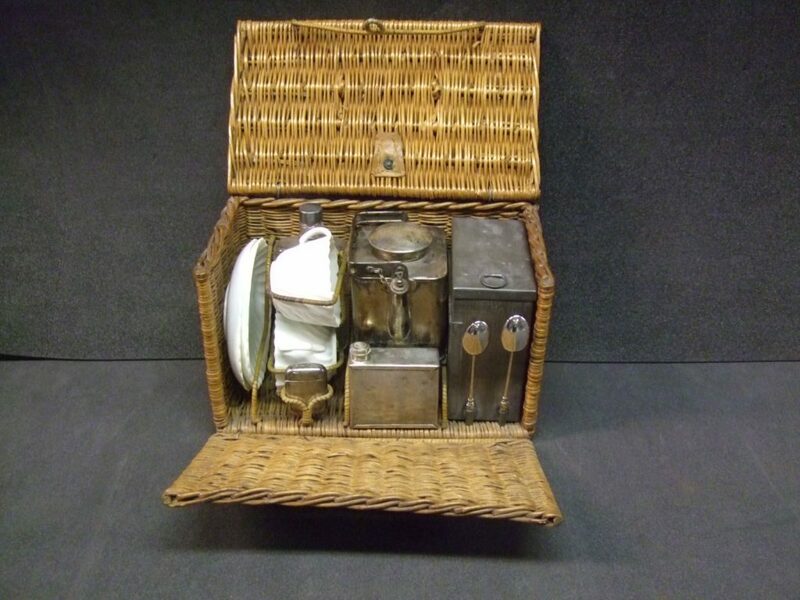 They date from the early 20th century, and were designed to make tea on the go: for picnics or expeditions. The tin set is labelled Sirram, which is Marris backwards and was a brand name used by George Marris & Co of Birmingham. 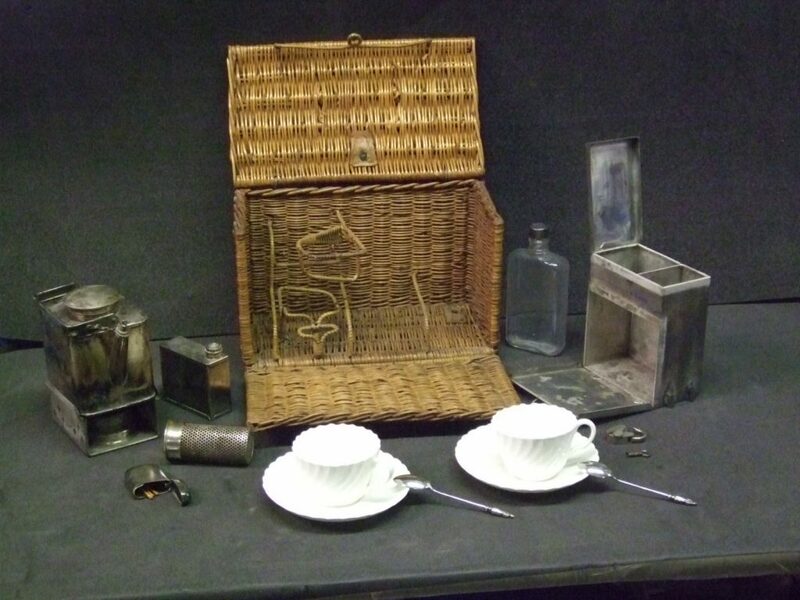 It contains a kettle/teapot, in which are packed tins for tea, sugar, cream (rather than milk) and spirit (for the stove, not to add to the tea), a stand for the kettle which works as a windshield for the spirit burner, two tin cups and saucers, a butter bowl and tea infuser. It is probably missing only its teaspoons and butter knife. 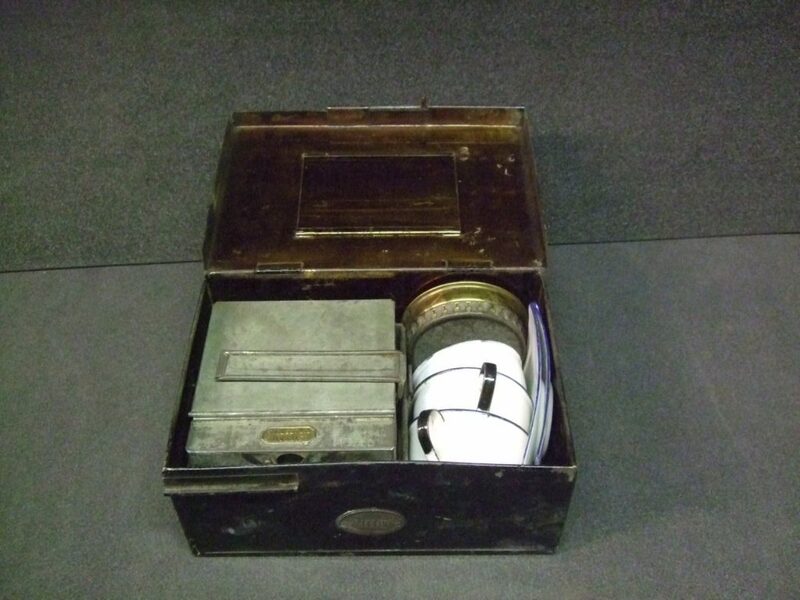 The tin tea set packed up in its case. 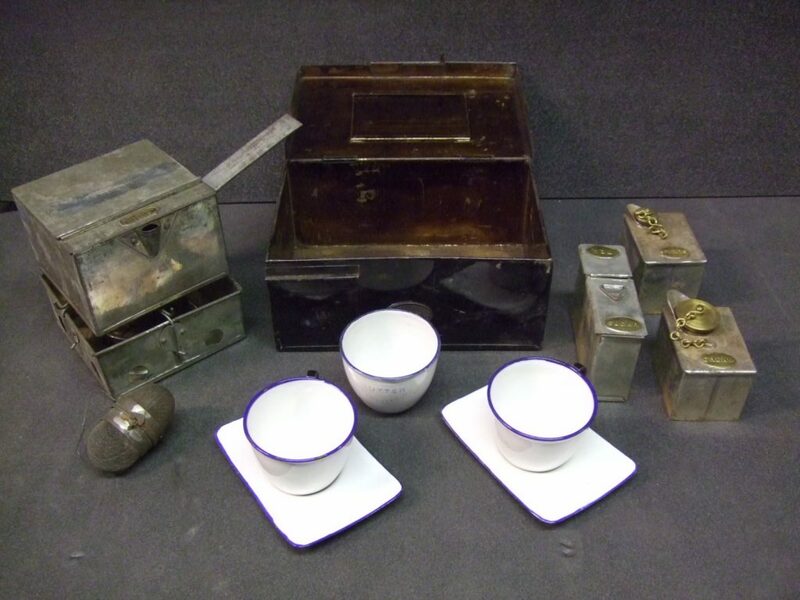 The tin tea set – including butter bowl! The other set is slightly less robust, with Minton china cups and saucers and a wicker case. In addition to a kettle/teapot, burner and storage containers it has a Vesta case for matches and an extra small compartment for cake or other food, but no butter bowl. The kettle has a screw cap on the end of the spout so that it can be used to carry water. The china tea set packed up in its wicker case. One slightly puzzling aspect of these tea sets is that they are held in the science collections of the Museum. This is because they were given to us by the Edinburgh City Analyst’s Laboratory. The role of city analyst became established around the 1870s and the bulk of their testing seems to have dealt with questions of food safety and adulteration. Had whole milk been diluted with water or skimmed milk? Were lead or mercury pigments used in colouring sweets? Was the water safe to drink? They also answered questions about the quality of the gas in the gas mains and poisons for criminal trials. Edinburgh Scientific Services continue many aspects of this work today. Why would the city analyst’s laboratory have had these sets? Perhaps they had them to provide boiling water if needed on a field trip, but they could have done that with the kettle and burner alone. As these are complete sets it is more likely that some of the analysts simply wanted to ensure they could have their tea wherever they were. Time to put the kettle on. Why would you want a wasabai fire alarm? Teacup, Tea cup or Cup, tea?